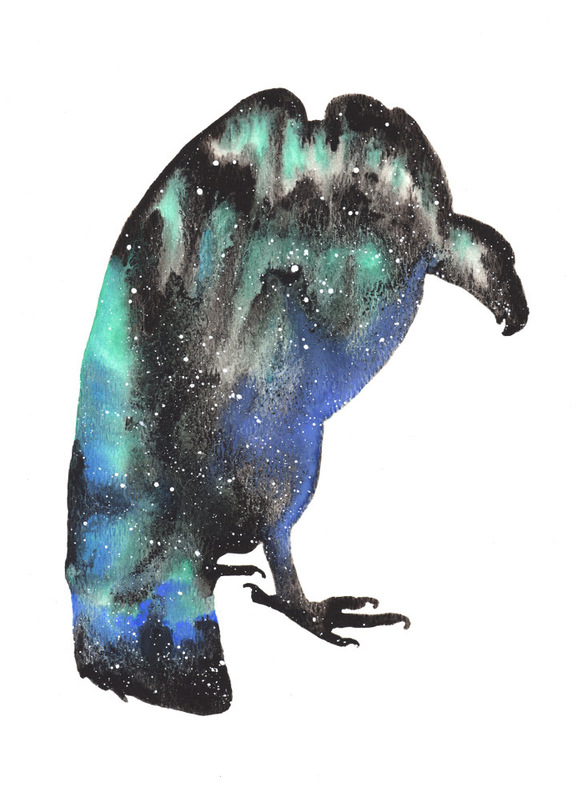 Vulture spirit animal symbolizes purity, restoring harmony, preventing the spread of disease, and being noticed for what you do instead of how you appear. No job is too small, dirty, or unimportant. They all matter! Vulture is there to restore harmony to forgotten places. Instead of a voice, Vultures communicate through performance and body language. By using their keen eyesight, they notice subtleties in others and read between the lines. It’s hard to see in moments of despair, but Vulture tells us suffering is temporary and is necessary to reach a higher purpose/growth. Vultures are also visually sensitive to thermal heat wave patterns. 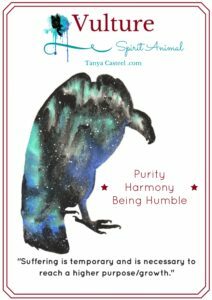 Working with Vulture can help bring out your ability to see auras and energy patterns. Vultures fly in a powerful and efficient manner and patiently use the rising heat waves to glide through the sky. What energy and resources are available to you that could help you flow instead of push – allowing you to levitate or rise to meet an objective or invitation? Nature is a master teacher. Research your animal’s habits in the wild and try playing & acting as it. How could this help shift your experiences? Vultures have powerful senses. They can spot a meal before other predators can find it. Trust your instinct in spotting a good deal and act quickly. Bald head? Vultures are cleverly created without feathers on their head or neck to prevent infections and stay clean while eating. Focus more on your own self-care and what works best for you. Not what others are doing or wearing. Often vultures strategically wait for other animals to rip open a carcass because they know their strength lies in their bills, not their talons. Identify where your strengths are and let others help you with your weakness. Vultures have the most corrosive stomach acid of all birds. You can take on the tough stuff. Don’t let other’s dramas and stress make you ill. Call upon your strong stomach to digest outside shadows so they are no longer a threat. Vultures are not very vocal — nearly silent. You don’t have to go through the world shouting to get attention or make a difference. Providing a humble service and presence can be its own intrinsic reward. You don’t need validation from anyone! Invite Vulture into your life. Surround, inspire, and remind yourself that your spirit animal guide is with you & within you. Embody the skills of your power animal and share your unique gifts with the world. I want to hear about your vulture experiences. What stories or dreams have you had? Please share and join in the conversation below! My grandson was riding his bike when a vulture flew up from the side of the road and knocked him off. Thinking that he had just bruised his arm his mom waited to take him to the Dr. Expecting it to heal on its own, which it didn’t. As time passed it just got worse. After an MRI my grandson was diagnosed with osteosarcoma. He is currently going through chemo at UAB children s hosp.in Birmingham. Had the vulture not intervened the tumor may not have been caught before spreading.